Although it was rumored that the iPhone X would be a flop, the latest sales figures are showing the exact opposite. 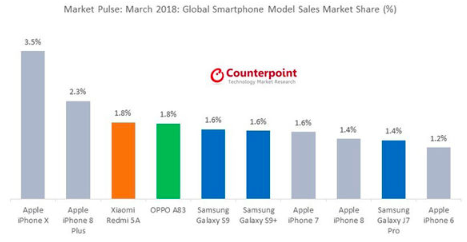 After industry analysts Counterpoint published research on global smartphone sales for March 2018 it is clear that the iPhone X has topped the list, with Apple’s flagship taking a 3.5% share of the market–well ahead of Android. The next best phone after the iPhone X was also the iPhone 8, with a 2.3% share. Apple generated a total of $48.35 billion in profit during its fiscal 2017, and made $13.8 billion during the March 2018 quarter. To put these numbers into perspective: the profit that Apple has made within the first quarter of 2018 is more than Amazon has ever generated since its inception. Apple’s CEO, Tim Cook, was quick to report that this was their best March quarter ever, with revenue going up in all major operations, including services and wearables. They also grew revenue in all of their geographic segments, with over 20 percent growth in Greater China and Japan. There are several rumors in the air regarding a new iPhone release later this year, a couple suggesting the iPhone SE being unveiled at its developer’s conference, beginning on June 4 in California. Although most of these products are rumored, it will be exciting to see what Apple has in store for the remainder of 2018.